HP has decided its printer line-up for next month’s FESPA Digital 2012, including the first showing at a major international exhibition of the new HP Designjet L26500 and HP Designjet L28500 printers. Both use HP Latex Inks and offer a broader range of indoor and outdoor signage print solutions. The Barcelona display area, extending beyond the exhibition hall (Hall 3, Stand G5), will allow HP to present a range of its printers for flexible and rigid applications both on its stand and at its GSB Experience Centre in nearby Sant Cugat del Vallès. At the centre, which a special exhibition shuttle service means is just 25 minutes away, HP will demonstrate the full Sign and Display portfolio (including the new HP Scitex FB7600 Industrial Press, the HP Scitex TJ8600 Industrial Press and HP Scitex XP series printers). The 2.64m (104in wide) HP Designjet L28500 Printer, launched in November, delivers speeds up to 70 per cent faster than the HP Designjet L25500 Printer, while the 1.55m (61in) HP Designjet L26500 Printer is ideal for those entering the growing soft-signage market. Both systems feature new HP 792 Latex Designjet Ink cartridges and offer double-sided printing capabilities with less user intervention and more accurate, automated registration. Also on show from the HP Latex printing range is the established 3.2m (126in) HP Scitex LX850 Industrial Printer, a production solution with multiple workflow features, including dual-roll, roll-to-free fall and roll-to-collector handling and an ink collector. Along with the printers using HP Latex Inks, information and advice will be available to help PSPs (print service providers) reduce their environmental footprint. The HP Scitex FB700 Printer which can produce high-quality prints on virtually any rigid or flexible media using UV-curable inks. The FB700 prints on materials up to 6.4cm (2.5in) thick and up to 2.5m (98in) wide by 3.05m (120in) long for the production of durable outdoor and indoor applications, including point-of-purchase displays, tradeshow graphics, interior decorations, banners and furniture. An optional White Ink Upgrade Kit for specialty applications is also available. The HP Designjet Z6200 Photo Printer with HP Vivid Photo Inks. The HP Designjet Z5200 PostScript® Printer – which HP maintain is a simple, affordable device for small commercial print businesses interested in entering the large-format market. HP personnel will be there to provide information on high-end production devices like the new HP Scitex FB7600 Industrial Press. A video will focus on the capabilities of this machine to enable PSPs to evaluate its potential for their businesses. 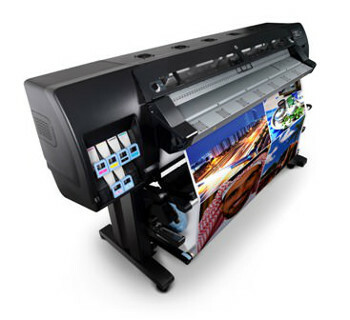 It has the production capabilities to deliver speeds up to 95 full boards per hour and a new POP print mode that images 55 full boards per hour with indoor quality. The press can also handle a wide range of flexible and rigid media. HP will also have special focus areas on the stand to provide business-building advice and examples of applications showing PSPs how to expand their services into areas of interior decor and textile printing, as well as their environmental programmes.